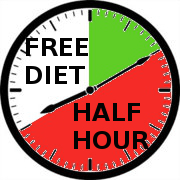 The Half Hour Diet is not about eating slowly. It is about moderating food intake then giving time for natural controls to lessen hunger so that, after a pause, it takes less willpower to resist eating more. Once you learn to recognize the onset of satiety, you can also learn to expect it and to wait for it. You eat a smaller portion as fast (or slow) as you like, and you may not have to change what you eat if a brief delay allows satisfaction on reduced portions. So, For A Simple, Free Diet . . .
On taking medicine, we wait an hour to feel the effect, before considering a second dose, because everyone knows there is a delay in pain relief. If we took pill after pill until the pain disappears, we would overdose. The same is true for food. A meal of calorically-dense food is so small that the stomach will not feel full. Because relief from hunger is delayed 30 to 40 minutes, we often fill up (overdose) on seconds and thirds before the first portion has taken effect. Most people, at some time, have been interrupted during a meal and returned only to find they were no longer hungry for the food remaining on their plate. Just 3 Steps: Eat, Pause, Reflect. . .
Eat less than usual (i.e. don’t eat till full). Distract yourself for half an hour. Then, if you are still hungry, have a little more. Hunger and satiety (satisfaction) arise in the brain. After a meal, it takes time for signals from the stomach to reach the brain, eliminate hunger, and produce satisfaction (satiety). If the effect were immediate, we would always eat just the right amount, but with plentiful food and hurried meals, we now routinely overeat during a delay that confuses the brain. However complex its biochemical origins may be, the simple fact of a delay in satiety can explain overeating to obesity in otherwise normal people. During a meal, the sooner we experience satiety, the less we eat and the less we will weigh. If satisfied “too early,” we eat too little and weight falls. If satisfied “just right,” we take no extra calories and weight is stable. If satisfied “too late”—just a few hundred extra calories per meal—we feast to obesity. In times of feast or famine, delayed satiety had a survival advantage, encouraging excess calorie intake to store energy for later food scarcity. Early in our recent time of plenty, mothers regulated food availability, blunting the urge to overeat. However, in our now constant state of plenty, delayed satiety is a survival disadvantage because it contributes to overeating and the many ill effects of obesity. With ever greater abundance of food, the only time we face external limits is from self-imposed adherence to restrictive diets, and most of us do lose weight on a variety of such diets. However, when we stop the diets, we typically regain the weight, leading to repetitive cycles of dieting and weight gain. Our obesity epidemic seems not entirely due to poor food choices (the problem is worldwide) nor a new defect in our biology (most of us do still experience satiety). 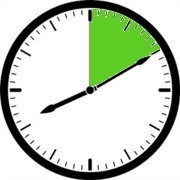 Since we may be unable to reduce the delay in satiety (without resorting to medicines), knowing the effects of meal timing can help us adjust our expectations and perhaps achieve a sustainable reduction in calorie intake with a brief pause. The hardest part is waiting through the first thirty minutes. There are several problems with using fullness to signal adequate food intake. First, the stomach is a muscular pouch, which can stretch to accommodate more food, so a full stomach can mean different amounts of food. Second, many foods pack a lot of calories into a small volume (high caloric density), so a full stomach might hold more calories than we need in a day. Third, after eating till full, the arrival of satiety a half hour later transforms feeling full into an uncomfortable sense of feeling bloated. If you are over forty, you probably remember putting less food on your plate, rarely having seconds, feeling bloated only one meal per year (Thanksgiving dinner), yet never leaving the table hungry because meals were family events that lasted forty-five minutes. We may not have eaten our food any slower, years ago, but we did linger around the table. Today, families are smaller and we have more entertainment options. We seem to eat faster and savor our food less, and because we cannot feel satisfied in ten minutes, we often use a sense of fullness in the stomach as an immediate substitute for delayed satiety. But it takes much less food to satisfy the brain's hunger. At your next meal, eat as fast as you wish, but try eating less than usual (one half to two thirds), then note how you feel every five minutes for a half hour. This experiment is especially easy with pizza: eat half as many slices (or just one slice) as fast as you like, then pause and reflect. Most people will be just as hungry for the first fifteen minutes, but around twenty minutes, many will start to feel a change that grows stronger. It will not work for everyone, but if, after a half hour, you are nearing satisfaction, you have the best chance to lose weight on the Half-Hour Diet. This is the diet many mothers used to recommend: Eat your vegetables. Have a little protein with each meal. Don’t ruin your dinner. No eating after the kitchen is cleaned for the night. Don’t gobble your food. Leave some for your sister. Don’t stuff yourself. No, you may not have the last pork chop. This diet is simple: Some say “it’s so simple, it’s too good to be true,” but that apparent simplicity (there is no lengthy book to read) depends on complex, neurobiologic controls that work in the background even though few of us fully understand them (in the same way we use our computers, telephones, and cars without knowing all the details). You can start this diet right now: There is nothing to buy. The red zone on this site’s logo is your Free Half Hour—use it well. And as supported by recent research, and by generations of mothers, build your daily routine on a 12-hour overnight fast. If you stick with this method of eating and follow the principles outlined, this does work. After some recent health problems, Dr. Burke and I discussed how the Half-Hour Diet could work for me. I started reducing my portions and stopped snacking at night. I only eat dessert one night a week, if that much. Between May and August I lost 18 pounds. I then started going back to my “regular” (oversized) portions and promptly put half of that back on. 🙁 So now it’s back to smaller portions and this time I have to stick with it. I know that this method of weight loss works, but I give up on myself to easily. I know that I am worth more than the number on the scale, but I’d sure feel better inside and outside if it were less. I am a former patient of Dr. Cyril Burke and he had suggested this diet to me. After being sick for two weeks and starting the weight loss trend, I decided to try the half hour diet and funny as it seems…………. Since May 2, 2014 until now I have lost 32 pounds and still losing. I am happy as can be and I recommend anyone looking to lose weight and have failed at other diets, give this a try! Well I’ve been on the “Half Hour Diet” for a little over a year now and have lost about 42 pounds. I love that I’m in total control of how I handle this. I am not one who can actually stay on a “diet”, if you tell me not to eat something, that the first thing I want. With this method I don’t feel cheated by not being able to have a certain food. I still eat anything I want. I just do it in moderation!!! I will try this half hour diet,it seems easy enough. Our conversation, really made me think about the obvious. The three simple steps you made me aware of, have been there for many years, but you were the only one who made many people see the truth that has been there our entire lives at no cost. You are an Angle sent to advise others to just open their eyes and see what has been directly in front of us at no cost. It was my pleasure to pass it on or pay it forward. Thank You. You will continue to be blessed through out your life, because what you do comes from deep inside. I was faintly “aware” of the cognitive phenomenon the Half-hour Diet exploits, but pleased to discover its efficacy in reducing food intake. “Tricking” one’s system in this fashion is like cleverly getting around some software block to achieve a sought-after computer result. I extended the benefit from this phenomenon by using it to offset my daily aversion to beginning to exercise (the other part of maintaining suitable weight). Ignoring my brain’s discouraging signal as I begin to work out leads to relaxation ten minutes into my program, making the effort totally palatable. Fooling myself exercise-wise matches my trick in countering the notion that the food I serve my hungry self is actually needed. Copyright © 2010-2015 Cyril O. Burke III, M.D. All rights reserved.